Driving west on Wyoming’s Highway 14, a few miles past the town of Greybull, sits the small and unassuming South Big Horn County Airport. On an August day in years past the field would have been bustling with taxiing aircraft, the arrival and departure of aerial water tankers, and the sound of the maintenance run-ups of radial engines. Today the airport sits in relative quiet with only the sounds of the blowing winds and the nearby highway with cars and motorcycles on their way to and from Yellowstone National Park. Nearing the airport the tails of C-97 Stratofreighters, C-130 Hercules, C-119 Flying Boxcars, P2V Neptunes, and PB4Y Privateers are clearly visible in the field on the far side of the airfield. Closer, on the tarmac, are the more recently active aircraft painted in the white and red colors of the Hawkins & Powers Co. Turning off the highway and into the airport you are greeted by a pair of C-119’s, a P2V-7, and a C-45 Expediter that are on display in front of what was once the H&P office buildings. To the left is a Wyoming Department of Highways rest area, and to the right is a small 10x14 foot log cabin with no running water or electricity. The log cabin was built in 1902 but today it is the temporary home of the Museum of Flight and Aerial Firefighting. Mr. Ralph Reiner, an energetic man in his 80’s, along with his wife Lorraine work tirelessly trying to raise funding and generate local interest in order to keep the museum afloat. Despite pain in his back that would require an operation on his spinal column a mere two weeks before the Hawkins and Powers assets were to be auctioned off, Ralph was still working diligently to secure funding to purchase some of the historically significant H&P aircraft. The museum may be working in sparse conditions today but Ralph hopes that in the future it will be in a large building that is suitable to display many of the aerial firefighting artifacts currently in storage. When the museum was founded in 1987 it was housed and supported by Hawkins & Powers and it was always assumed that retired firefighting aircraft would one day make their way into the museum. When the fortunes of H & P changed so did those of the museum. 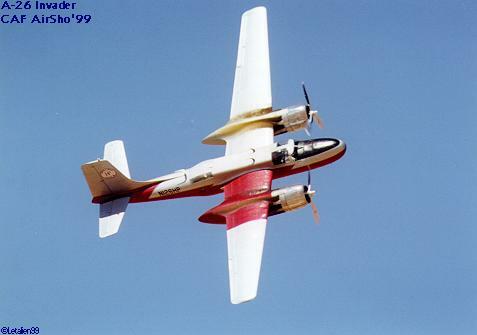 For nearly 40 years Hawkins & Powers flew and maintained a fleet of aircraft for fighting the West’s seasonal forest fires. Their formula was simple; take an aircraft designed to carry heavy loads, retrofit it with water drop capabilities, and be available when needed. The business also housed the facilities to support and maintain their fleet of aircraft as well as provide maintenance and refurbishing services to others. The formula worked for H&P until one fateful day in June of 2002 when a C-130A Hercules fighting a fire near Walker, California, had a catastrophic wing failure resulting in the loss of the aircraft and the 3 crew members. Another aircraft, a PB4Y Privateer, was lost along with its 2 crewmembers a month later near Estes Park, Colorado, while making a retardant drop. 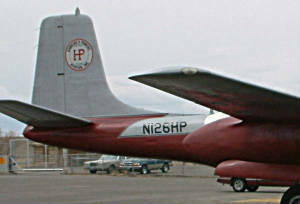 The net result was a grounding of heavy air tankers throughout the firefighting industry. The cause of the accidents was suspected to be undetectable metal fatigue, and H&P was cleared of any wrongdoing, but with its key assets grounded debt grew and it was only a matter of time before the business that was founded by in 1969 by Dan Hawkins and Gene Powers was forced to declare bankruptcy. H&P shut their doors at the end of 2005 and sold off their assets to the Great American Group to satisfy nearly $15 million that it owed to creditors. On August 23rd & 24th of 2006 a multitude of bidders gathered at the Big Horn County Airport to purchase what remained of the H&P assets. Many airworthy assets had already been sold to other aerial firefighting companies but there were still enough aircraft and parts left to excite many aviation collectors, engine rebuilders, and aviation museums. Still available for bid were the only airworthy C-82 Packet, PB4Y Privateers, an A-26C Invader, a C-97 that flew in the Berlin Airlift, as well as the C-119 Flying Boxcar that was used in the 2004 remake of the movie “Flight of The Phoenix” that starred Dennis Quaid. The C-82 Packet fetched one of the highest bids, $127,000, and was purchased by the Hagerstown Aviation Museum in Hagerstown, Maryland. The museum was a fitting destination for this unique sixty year old aircraft since it was originally manufactured at the Fairchild plant in Hagerstown along with 222 others just like it. 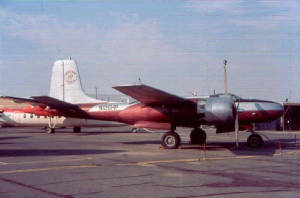 Another fitting destination was the C-119 Flying Boxcar, which along with the A-26C Invader, was purchased by the Lauridsen Aviation Musuem in Glendale, Arizona. 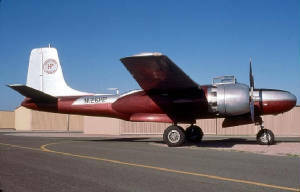 Glendale is 5 miles north of Phoenix and the C-119L is the same aircraft that was used in the remake of the movie “Flight of the Phoenix.” While the A-26 fetched $112,500 the C-119 was sold for $70,000 which also included 2 spare engines. Other notable purchases made during the auction were the 3 KC-97 Stratofreighters, a transport aircraft based on the fuselage of the B-29 Superfortress, were purchased by aviation entrepreneur and pilot Clay Lacy. Two of the aircraft are expected to be made flyable while a third will be used for its parts. Also up for auction was truckloads of radial engines, propellers, and other parts that were hauled away by engine builders and museums. Some of the aircraft that were in long term storage may not fare as well. Two of the P2V-7 Neptunes, a 1950’s era Navy Patrol Bomber, sold for less than $6,000 each which was far below the scrap value of the aircraft. Ralph Reiner and the Museum Board were left to wonder what, if any, of the H&P legacy would remain in Greybull. Falling short of his original goal of raising $900K in order to purchase 6 historically significant firefighting aircraft, the museum instead had to accept whatever was left over or not bid upon. 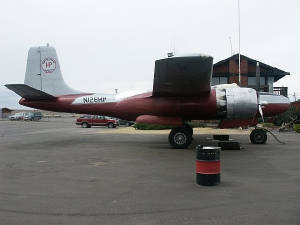 Once the dust had settled the Museum of Flight and Aerial Firefighting Museum was left with the two C-119’s, C-45, and the P2V-7 Neptune that were on display at the entrance. The museum will also retain one of the KC-97 Stratrofreighters, a C-130 Hercules, as well as at least one of the PB4Y Privateers that was not placed on the auction block. Ralph has big plans for the future. The museum has acquired a lease from the Big Horn County Airport for land directly behind the Wyoming Highway Department Rest Area where he hopes that a large display building will be constructed as well as cement pads for the aircraft that will be on display. With the museum located on a major tourist route between Interstate 90 and Yellowstone National Park he thinks that many tourists will want to stop and visit the museum as part of their vacation travels. Ralph is in negotiations to procure a P-3 Orion, a P2V-7 Neptune, and a DC-7 from another aerial tanker company that was not able to re-certify them for firefighting. He also intends to spend the winter applying for grants to purchase surplus aircraft that are currently located in Arizona and New Mexico. When Hawkins & Powers closed their doors an era of aviation ended. Many of their aircraft are now scattered across North America either to complete their life as aerial firefighters, on display in museums, or into the hands of private collectors. The parts cache that they maintained to support their air operations are now bringing new life to other warbirds. Ralph Reiner and the Museum of Flight and Aerial Firefighting are hoping that they can preserve a small piece of the legacy that Hawkins & Powers brought to the Greybull area as well as the science of aerial firefighting. Manufactured by Douglas Aircraft, Long Beach, CA, 1945. Delivered to USAF as 44-34520, June 22, 1945. - Transferred to storage, Sacramento Air Materiel Center, McClellan AAF CA, June 1945. - Transferred to Douglas Aircraft, Long Beach, CA, Nov. 1950. 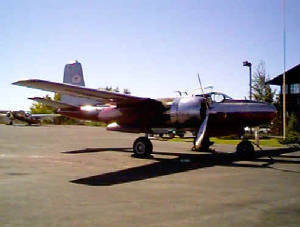 -- Converted to B-26C standard. - Transferred to Ogden Air Materiel Area, Hill AFB, UT, Feb. 1951. - Transferred to 452nd Bombardment (Light) Wing (Far East Air Forces), Miho AB and Pusan AB Korea, April 1951. - Transferred to 17th Bombardment (L) Wing (FEAF), Pusan AB and Miho AB, May 1952. - Transferred to 6408th Maintenance and Supply Group (FEAF), Kisarazu AB, Japan, July 1952. - Transferred to Sacramento Air Materiel Area, McClellan AFB CA, Sept. 1952. 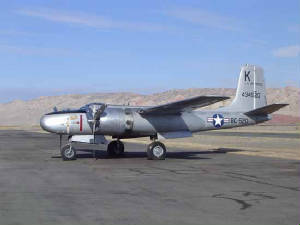 - Transferred to Ogden Air Materiel Area, Hill AFB, UT, Jan. 1953. - Transferred to 461st Bombardment (L) Wing (Tactical Air Force), Hill AFB (deployment to Wendover AFB, UT), March 1954. - Transferred to 2347th Air Reserve Flying Center (US Air Force Reserves), Long Beach AFB, CA, July 1955. - Transferred to Davis Monthan AFB, AZ for storage, Feb. 1957. Jul 1958 Dropped from inventory as surplus A.S. Wilstrom Inc, New York, NY, 1963-1972. 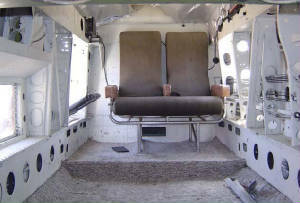 - Converted to executive configuration by LeTourneau Co, TX. Conair Aviation Ltd, Abbotsford, BC, Apr. 1974-1988. 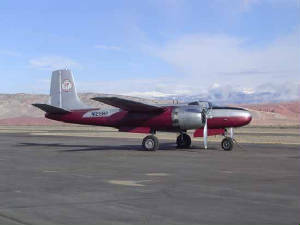 - Flown as tanker #28. 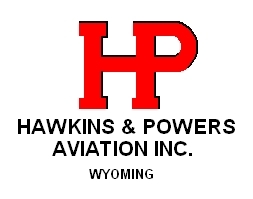 Hawkins & Powers Aviation, Greybull, WY, Nov. 1988-2000. - Reregistered as N126HP, July 1989. D&G Inc, Greybull, WY, Aug. 23, 2000-2006. - Displayed at Greybull, 1999-2000. - Displayed in red white tanker #28 scheme on right side. - Displayed in USAF/434520/BC-520/K Lu Lu on left side.